Black Diamond LiveWire Carabiner. 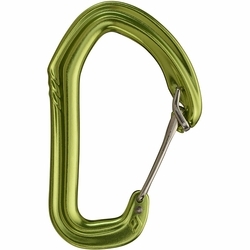 Black Diamond's premier sport climbing wiregate biner, featuring a sculpted, hot-forged design and the snag-free, keylock benefits of HoodWire Technology. The Black Diamond LiveWire carabiner features a sculpted, ergonomic shape with the snag-free benefits of HoodWire Technology. Thanks to a simple metal wire on the carabiner's nose, the LiveWire delivers the benefits of a keylock biner in a wiregate design. Forged ribs along the spine make for quick and secure thumb clipping, and the draw-friendly basket keeps the biner properly oriented.